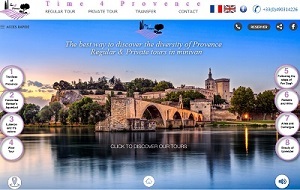 PRIVATE TOURS - DO IT YOUR WAY ! Its color,...its landscapes,...its art and history,...its wine and gastronomy,...taste it your way ! With our experience and your interest we can create the perfect tour just for you. With our customized tour you can rely on our professional and passionate driver/guides who will ensure that you will fully enjoy this experience. Whether you are an experienced cook or just a beginner and you want to learn from the best, try our culinary lesson with a reputable chef in a characteristic Provincial village followed by wine tasting with a professional sommelier in Châteauneuf du Pape. Start the day with a beautiful and easy trail around Uzès with a typical, Provincial picnic. What could be better than finishing this day with wine tasting in the famous Châteauneuf du Pape? !